Covenant Community Church has four ministry teams that serve the needs of our church and our community. Each ministry team is lead by a member of the church and is made up of other members who feel lead to help serve in those areas. 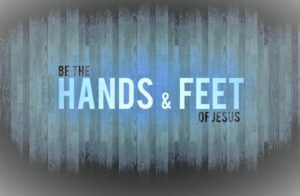 We encourage all members of CCC to join a team and help carry out our mission inside the church and into our community and world. Worship Arts: This team helps the congregation by seeking to cultivate an environment that draws people into God’s presence for corporate and personal worship. Outreach & Community Service: This team looks for ways that the congregation can engage with the local and global community. Congregational Life: This team focuses on the spiritual, emotional and physical health of the church. Building & Administration: This team focuses on supporting all the ministries of the church. Serve with Love @ Town Meadow: At Covenant Community Church we want to build relationships with our community by “going outside our walls” and serving our neighbors. Each month we visit Town Meadow Senior Living Community for an afternoon of serving and fellowship. Activities have or will include assisting in light housekeeping, running errands, preparing a meal, and providing music occasionally. Covenant Community Church Soup & Bread Supper: We host a Community Soup & Bread Supper on the first Thursday of the month October through May. We serve a variety of soups including vegetarian, gluten free choices, breads, and chocolate chip cookies. Serving from 4:30-6:30 p.m. This is a wonderful time to share a meal and fellowship together. Take out is also available. 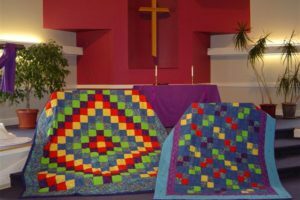 Covenant Community Church Compassion Quilts Ministry: We make, bless, and share quilts with people who are in a time of struggle. Whether it’s a struggle with illness, grief, or mental or family problems, we give a quilt as a symbol of our care. It’s beautiful to wrap yourself in a handmade quilt, warmed by the prayers of a community who cares. It’s healing to know that God’s grace surrounds you. A Compassion Quilt is given with love with no strings attached. We give quilts to folks in church and in the community. Some quilts are returned and given out again. Some quilts are kept forever. Quilts are given to share God’s healing, comforting grace. You can help us with this good work! Let us know who would benefit from receiving a quilt. Senior Meals at Covenant Community Church: For twenty years our church hosted a senior meal once a week for the Agency on Aging. When their federal funding was decreased in 2016 , our meal site was closed. However, the people attending had developed strong friendships and it was the only time many of them could meet due to transportation issues. Our church members took over and now, once a month usually on the first Monday, 11:00-12:30 lunch is served to the seniors from Essex, Jericho, and Underhill. They celebrate birthdays, holidays, and continue to support each other. Newcomers are always welcome. Essex Jericho Underhill Ecumenical Ministry Food Shelf: We work collaboratively with nine other churches in our area. The food shelf holds monthly food distributions and our congregation supports this effort in various ways. The food shelf is located at Good Shepherd Lutheran Church, Route 15, Jericho, VT. Because of our faith in Jesus Christ and his teachings concerning those in need, the mission of the Essex Jericho Underhill Ecumenical Ministry is to operate a community food shelf, provide educational experiences, and provide emergency aid for community members. EJEUM is a partnership of local churches, groups and individuals working together to combat hunger. We are a network partner of the Vermont Foodbank. You can find out more information about their work and how to get involved by clicking here. Food distributions are held at Good Shepherd on the third Saturday of the month, starting at 9:00 a.m. Copyright © 2019 Covenant Community Church.